On any given day your bike and accessories tell some kind of story about you, your riding, and your community. Here’s one snapshot. This fun bike rack is in the street (taking up–gasp!–a car parking spot!) in front of Kaffee Klatsch, the German bakery/coffee shop on Lake City Way near our neighborhood. Since I ride through here often I know the bike rack gets regular use and also serves to help calm traffic through a section with a lot of pedestrian travel; this is just south of a mid-block crosswalk by a transit stop. Smart of the businesses along the way to make room for 10 customers in this space, not just one. My Bern helmet purchased at Hub and Bespoke sports the knitted helmet strap cover/ear warmers knitted for me by friend Wilma Gyswyt Flanagan as a thank-you for my time on the Spokane Bicycle Advisory Board. I believe I get more compliments and questions about these ear warmers than about any other single bike accessory I own. I have not one but TWO Washington Bikes reflective stickers (which we give to our members) showing–one on my helmet, one on the bag. On the rack you see one of my beloved Po Campo bags along with a Detours bag made by a Seattle-based company that names all its bag models after Seattle neighborhoods; in one picture I’m supporting a woman-owned business and buying local. 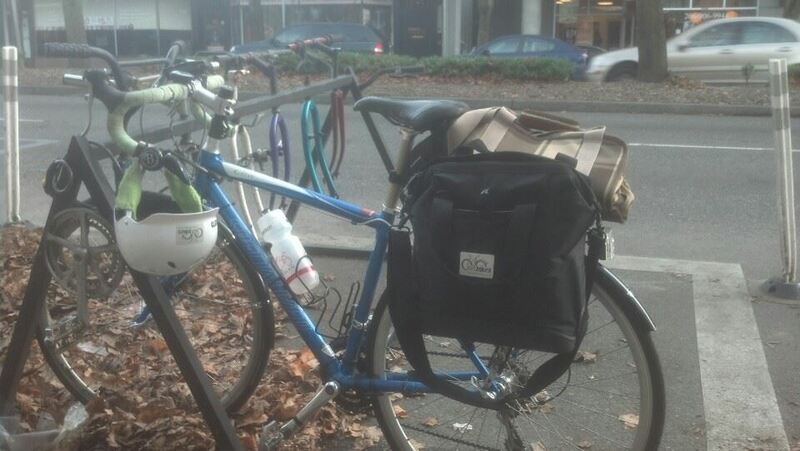 I have two bags because this is a grocery run as well as a coffee-and-pastries ride. My Sweet Hubs bought this bike for me not long after we started dating/riding together, when it became clear that my nameless big-box mountain bike was all wrong for the type of riding I did. If you look closely you can see the stem extender Hubs added to bring the handlebars up a bit. This helped address a burning sensation I’d been having across my shoulders and made the bike fit me better. I love lime green; Sweet Hubs wrapped the handlebars for me and Wilma made the strap cover that color. What stories would a picture of your bike tell?